Express Scripts Holding Co. gave chairman and CEO George Paz a 50% hike in total compensation for 2012, a year in which the nation's largest pharmacy benefits manager polished off a $29 billion acquisition, patched a key partnership and saw its stock price climb 21%. Paz, 57, received compensation valued at $12.8 million, according to the St. Louis company's annual proxy statement filed Thursday with the Securities and Exchange Commission. That's up from $8.5 million in 2011, when the executive received no bonuses after adjusted earnings fell short of the company's target. For 2012, Paz received a $3.4 million performance-related bonus and a 10% increase in salary to $1.2 million. Express Scripts also gave its leader $8 million in stock and option awards, up from $7.2 million in 2011. 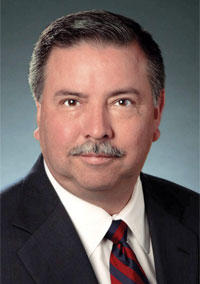 Paz has served as Express Scripts CEO since 2005 and as chairman since 2006. Express Scripts said in the filing that last year was "transformative" for the company, as it acquired former competitor Medco Health Solutions. That deal, which closed in April, created a pharmacy benefits manager, or PBM, big enough to handle the prescriptions of about 135 million people, or more than one in three Americans. "We are now a larger and more complex company, which impacts both our performance and decisions relating to our executive compensation program," the proxy said. The proxy filing noted that Express Scripts revenue more than doubled last year, and its earnings climbed 3% even though the company absorbed costs tied to the Medco deal. PBMs run prescription drug plans for employers, insurers and other customers. They process mail-order prescriptions and handle bills for prescriptions filled at retail pharmacies. They use large purchasing power to negotiate lower drug prices and make money by reducing costs for health plan sponsors and members. Express Scripts started last year muddled in a contract impasse with Walgreen Co., the nation's largest drugstore chain. Walgreen fills prescriptions for Express Scripts, but the companies had stopped doing business after they failed to agree on terms of a new contract. They resumed doing business last September after a split of nearly nine months. Overall, Express Scripts earned $1.31 billion, or $1.76 per share, on $93.86 billion in revenue last year. Its stock climbed 21% to close 2012 at $54, a bigger jump than the 13.4% increase registered by the Standard & Poor's 500 index. The stock has continued to rise and was trading at $57.71 Thursday afternoon. The Associated Press calculates an executive's total compensation during the last fiscal year by adding salary, bonuses, perks, and the estimated value of stock and stock options awarded during the year. It also includes above-market interest that companies pay on deferred compensation, something Express Scripts does not do. The value that a company assigned to an executive's stock and option awards for 2012 was the present value of what the company expected the awards to be worth to the executive over time. Companies use one of several formulas to calculate that value. However, the number is just an estimate, and what an executive ultimately receives will depend on the performance of the company's stock in the years after the awards are granted. Most stock compensation programs require an executive to wait a specified amount of time to receive shares or exercise options. Last year, Paz exercised an option to acquire more than 275,000 shares, realizing a value of $9 million, which is the difference between the exercise price for the options and the stock's market value when the options were exercised. He also acquired about 259,000 shares that had vested, with a value topping $13.5 million. These sums were not included in AP's calculation of the CEO's 2012 compensation.